I think in evaluating Marin, it’s important to remember that, so far as I can tell, towns like Fairfax and San Anselmo have always been commuter outposts. At first it was weekend vacation traffic (and out into the San Geronimo Valley), then the commuter rail made it easy to get into San Francisco, then, when cars got “better” (measured in a variety of ways) than rail, via automobile. This, of course, doesn’t apply to the vast expanses of private castles that are the Eichler developments, but it does point out that it’s been a commuter base for far longer than 30 or 40 years. Absolutely; the articles I linked to were about the central cities rather than peripheral ones like Marin. 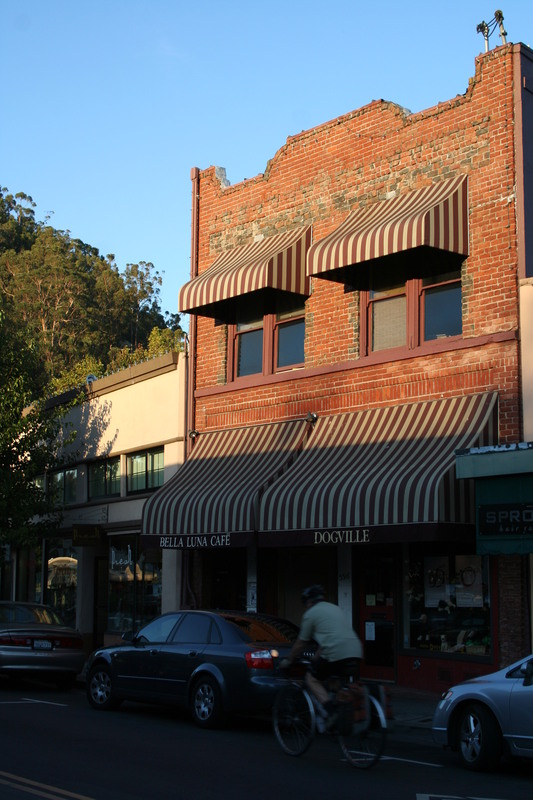 But during the railroading years it made sense to develop streetcar suburban cores – hence the tiny commercial developments near Lansdale and Yolanda Station in San Anselmo, as well as the town centers we have today. However, Marin will grow and that this growth should happen in ways that strengthen its town centers. To do that, residents need to see their town centers as mini-cities or, in the case of San Rafael, a satellite city: a place to live, as well as work and shop. “Village character”, a term often invoked in general plans, is absolutely compatible with single family attached or apartment residential development. Coincidentally, it would also make commuting easier, as transit would be more efficient. Augh! WordPress just blew away a long response. Sigh. WordPress login doesn’t seem to be working for commenting. To your side note: It’s weird, it makes sense that it was electrified, but since my interest was mainly in the steam out to west Marin, I can’t remember seeing pictures of anything but carried-fuel locomotives on those lines. I do find it interesting that, even though I agree that the reasons you cite are the primary motivators for switching to automobiles, the switch happened at about the same time that automobile efficiency per vehicle mile passed heavy passenger rail per passenger mile. On “Village character”: Yep, mostly there with you. I lived in Fairfax for about a decade, then moved out to Lagunitas, and when we moved from Lagunitas, a place with a downton and walkable neighborhoods was primary. Fairfax and San Anselmo were headed towards tourism with a heavy commuter contingency, San Rafael is a place where you drive downtown, and Novato may as well be in the central valley, so we moved to Petaluma. I am not, however, convinced that single-family attached dwellings will really work. Maybe it’s just that I grew up rural, but the economics of condos suggest that real estate cycles will always be more pronounced in such developments, whereas with organically grown grid neighborhoods you get houses rising and falling out of sync, which means that the neighborhood as a whole tends towards more stability long-term. Curses! I hate it when that happens; I’ve taken to copying my posts before making them. Actually, urban areas are much more resilient to real-estate cycles, at least if this last downturn is any indication, and that will typically mean either rowhomes (which is what I mean by “single-family attached”) or apartments. I’m partial to rowhouses, though, given that they’re still single-family but are energy efficient, can involve large, private yards, and still meet or exceed the 20 units per acre ABAG minimum without going over two stories. With the extremely common basement apartment a neighborhood can go to 44 units without sacrificing more than a half-story. They certainly do fit the grid neighborhood well and engage the street more than, say, duplexes – I can’t count how many times I’ve wandered through rowhome neighborhoods just to look at the architecture. They are, after all, the old Victorians San Rafael is so keen on protecting. One of the benefits of condo ownership is the ability to expand within a building, which often occurs in New York City. I’m not too much of a condo booster myself, but then again I know very few condo owners so I don’t have much of a feel for such developments.